A+Awards: another of this year's winners at the Architizer A+Awards is a wood-sided bridge that connects Paris with the suburb of Aubervilliers. Designed by French architecture studio DVVD, the bridge gently curves over the busy dual carriageways at a point north of the city centre. "We designed it as a thin recognisable line overflying the main European ring road," said the firm. "It binds the streets on each side in a smooth movement that creates continuity, sequences the views and livens up the crossing." It was created as part of a programme to reconnect Paris with its suburbs, which were largely cut off for pedestrians after the 22-mile ring road was built during the mid-20th century. "The Périphérique doesn't appear as an insurmountable barrier anymore: it is reinstated as a boulevard," DVVD said. 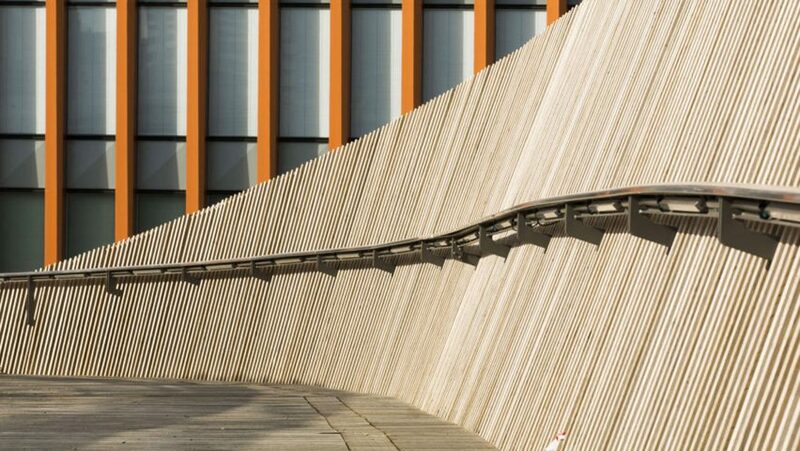 Chosen to add warmth, the wood strips that run along each side of the steel structure reduce car noise for crossing pedestrians and cyclists. The bridge was installed in just one night to keep traffic disruption to a minimum, and won in the Highways and Bridges at this year's A+Awards. Organised by Architizer, the awards promote and celebrate the year's best projects and products. Photography is by Luc Boegly.